Pakistan’s leg spin sensation Yasir Shah has become the joint second-fastest bowler ever to complete 100 Test wickets. The 30-year old also reached the milestone a match quicker than his arch rival in Indian off-spinner Ravichandran Ashwin to etch his name in the record books as the quickest Asian bowler to the landmark. 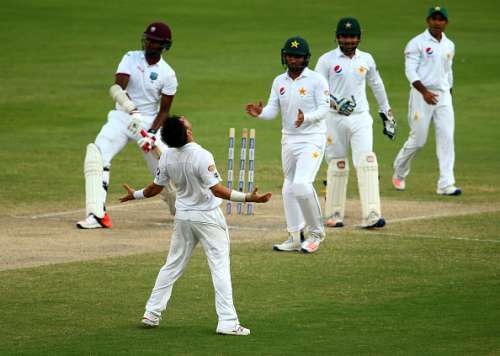 Needing 5 wickets to reach three figures, the wrist-spinner managed to weave webs around the West Indies batsmen on a docile pitch in the 1st Test at Dubai. He picked up his seventh five-wicket haul to help secure a 222-run first innings lead for the Pakistanis in the second ever pink ball Test. Entering into day four of the ongoing match requiring three more scalps, Yasir dented the lower order’s hopes with a flurry of breakthroughs. When he found the rough area to castle Miguel Cummins, the leg-spinner made his way into elite company featuring some of the best ever bowlers to play the game. While his close competitor Ashwin reached the 100 mark in 18 Tests, he achieved the feat in 17 matches and joined the likes of Charlie Turner, Sydney Barnes and Clarrie Grimmett to become the second quickest to the milestone. However, England seamer George Lohmann still stands on top of the list after having taken only 16 Tests to complete 100 wickets. In a career spanning between 1886 and 1896, the right armer picked up a total of 112 wickets from 18 matches at an astounding average of 10.75 and strike-rate of 34.1, both of which are yet to be matched even after over 120 years. Ashwin had reached the landmark in the 2013 Mumbai Test against West Indies. More recently, the Tamil Nadu off-spinner became the second quickest to the 200 mark during the first Test against New Zealand at Kanpur after Australian leg spinner Grimmett. At a time when all sporting relations between India and Pakistan have been suspended due to the tense security situation, the camaraderie amongst cricketers from the two nations is laudable. Interestingly, the top three names in the below-mentioned list of the quickest to 100 Test wickets are all seam bowlers with only the next five being spinners. Opinion: Where does Babar Azam stand at the moment?